SIMON Callow and Jane Asher start a UK tour in Noel Coward’s A Song at Twilight at Bath Theatre Royal, from Wednesday 13th to Saturday 23rd February. One of The Master’s final plays, and originally part of a trilogy, A Song at Twilight is described as an intriguing drama of secrets and lies. The new touring production is directed by Stephen Unwin. World famous author Sir Hugo Latymer is growing old, rude and haughty. In the private suite of a lakeside hotel he is attended to by his long-suffering wife and former secretary, Hilde, and Felix, a handsome young waiter, as he nervously awaits the arrival of an old flame, actress Carlotta Gray, with whom he enjoyed a two-year love affair more than 40 years ago. What can she possibly want now? It is revenge for his uncharitable characterisation of her in his recent autobiography … money to compensate for her second-rate acting career in the States? But it turns out that Carlotta is writing her own memoir and wants something much more significant than cash. At its premiere in the West End in 1966, Coward made his stage farewell in A Song At Twilight in the semi-autobiographical role of Sir Hugo. The play is full of his characteristic sharp wit and repartee, poignantly exploring the risk of harbouring secrets and the regret of missed opportunities. 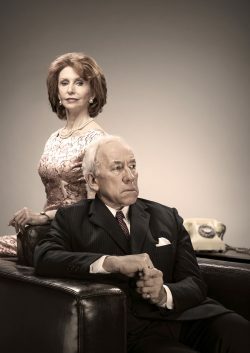 Simon Callow stars as Sir Hugo Latymer with Jane Asher as Carlotta Gray. Hilde Latymer is played by Jessica Turner with Ash Rizi as Felix. Posted in The Play's the Thing on 8 February, 2019 .